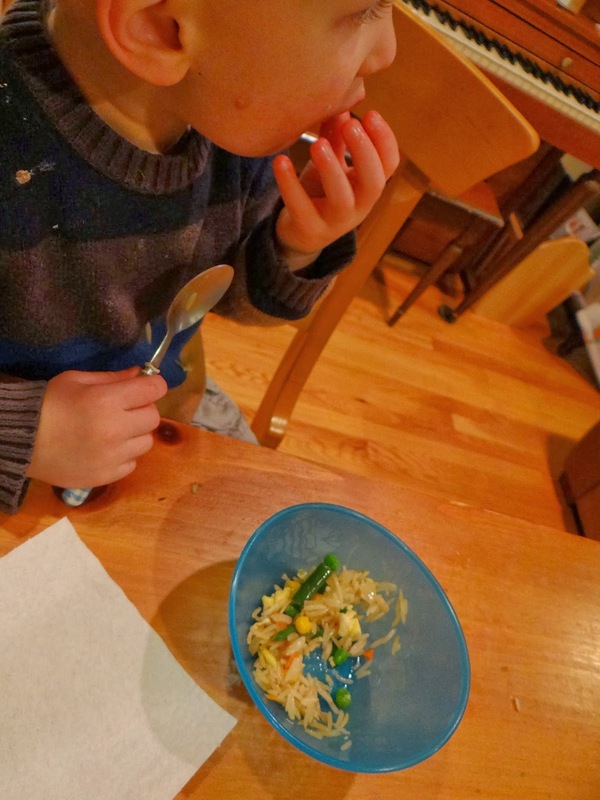 Fried rice has become a staple dinner in our house. It’s my go-to dish once a week, and it’s great because it makes lots of leftovers and can be scaled up or down. Our favorite Indian take-out place always gives us extra rice, and this recipe uses it up beautifully. The recipe is best with pre-cooked and cool rice, not hot rice. 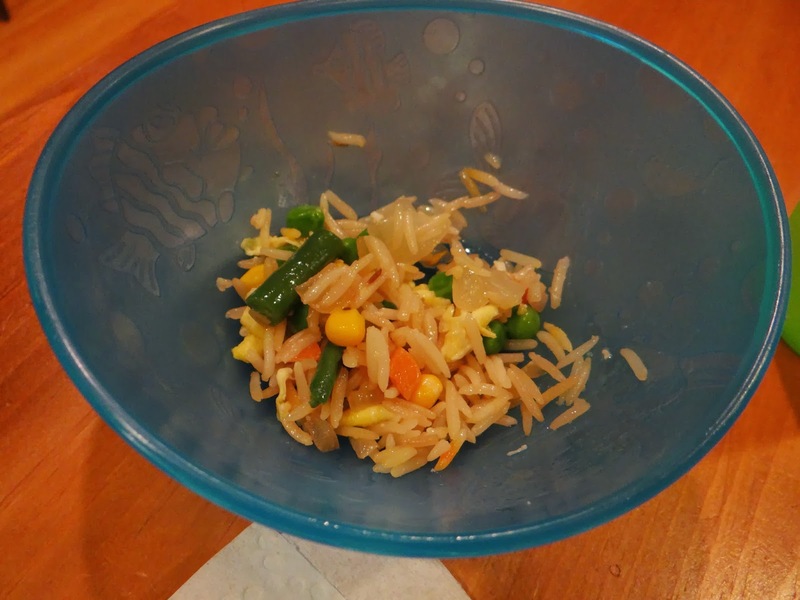 If you already have the cooked rice, the rest takes at MOST 15 minutes from start to finish. 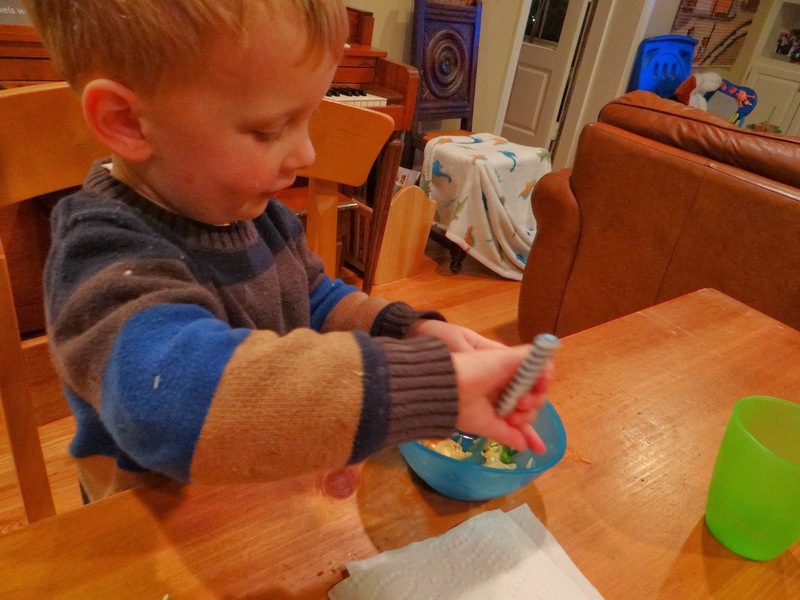 Little Bread Toddler LOVES this recipe, which is great because I use it to sneak in all manner of vegetables and eggs for protein. 2. Pour the peanut oil into the skillet on medium-high heat. When the pan is ready (the oil is shimmering) add the onion and saute until translucent. 3. Add the vegetables to the skilled and coat with the oil. Cook for a few minutes until they seem not frozen. 4. Add the rice to the skillet and toss around to combine. 5. 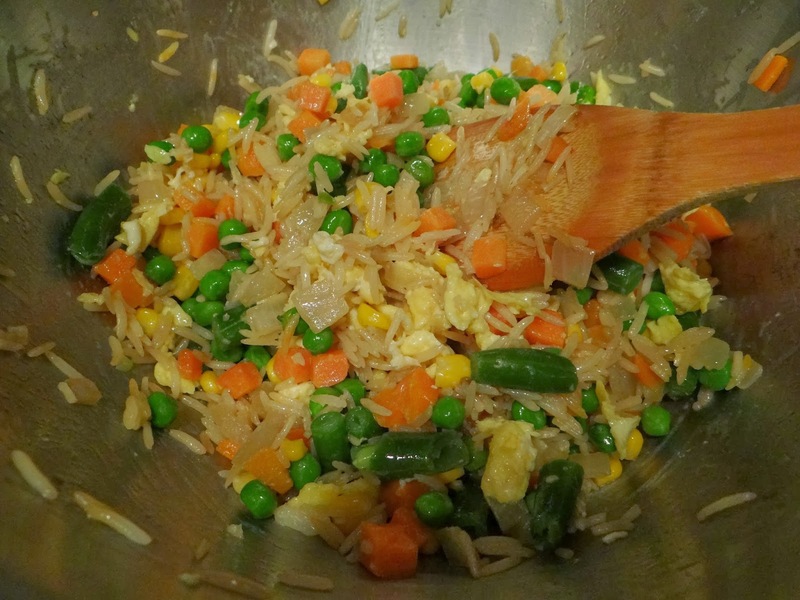 Remove the vegetables and rice to a large bowl. 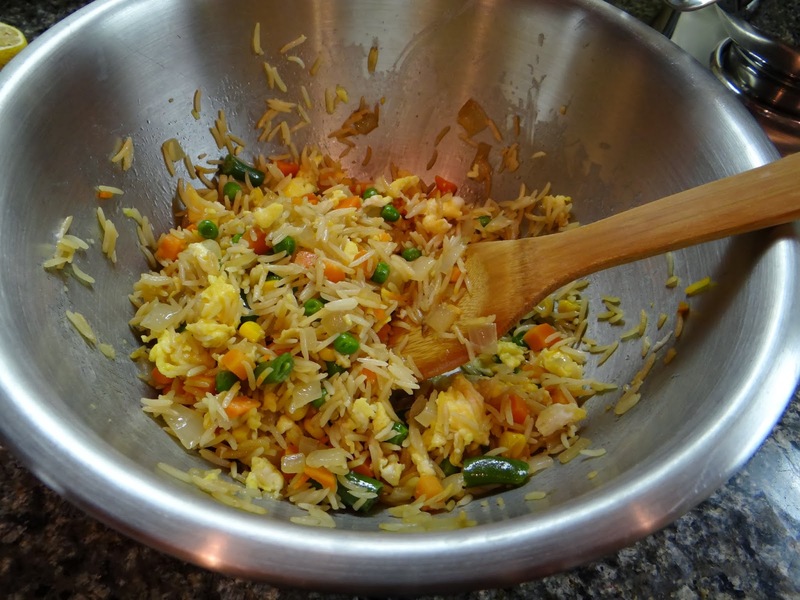 Use your spatula to scrape most of the rice and vegetables out of the skillet then return to the fire. Add more peanut oil, about a tablespoon. 6. While you’re waiting for the peanut oil in the skillet to heat up, add the soy sauce, sesame seed oil and mirin to the bowl of rice and vegetables. Stir to combine. 7. Add the eggs to the skillet and scramble them. 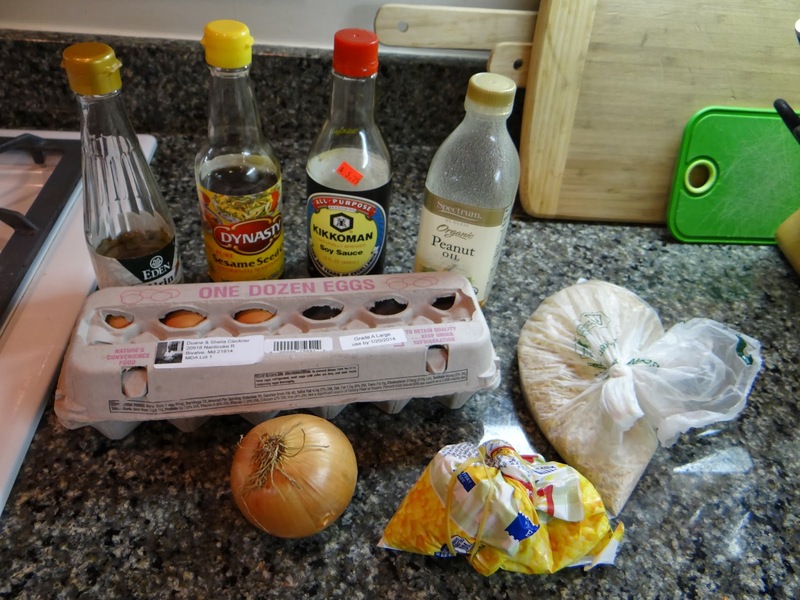 Then using your spatula, break the scrambled egg into small pieces and add them to your rice and vegetables. 8. Tada! You’re done! Time to eat! Little Bread Toddler saw it in the skillet and said, “I want something else,” then proceeded to eat four bowls of the stuff. Again, he’s a messy eater.